Raptor 27.5(650b) - HED CYCLING PRODUCTS INC.
27.5+ is here to stay, and we’re here to dominate it. With new bikes, new wheel sizes, and new options, every rider can have the perfect ride around their local terrain. More and more people are seeing the benefits of larger tires, and plus-size (3-inch) tires are finding a niche between fat bikes and skinny 2 - 2.5” mountain bike tires. Since we can’t seem to do anything half way, we wanted to bring out the widest, lightest, and most durable all-carbon rim for your 27.5+ rig – the Raptor. With a width of 45 millimeters, and an astounding rim weight of 430 grams, the Raptor will shock you with its speed. No longer must your plus-sized bike be heavy, slow, and lumbering – let the Raptor inject some True Speed into your trail ride. The Raptor is approved for XC mountain biking, and “reasonable” enduro / all-mountain riding. 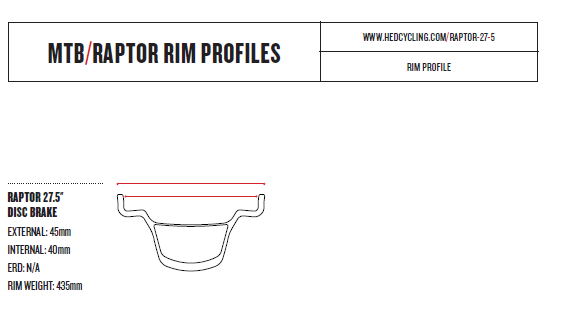 It is not a downhill-specific product, and is not intended for downhill racing or other highly aggressive riding. We suggest that you use your best judgment, and err on the side of caution. Larger tires and higher pressures will help to protect the rim from impact damage.